Choose a crunchy sweet watermelon rind or a cilantro cream to accompany this flavorful dish. For the Watermelon Rind: In a medium bowl, combine the watermelon rind, water and corn starch. Set aside for 1 hour. Drain the water and rinse. In a small saucepan, combine the remaining watermelon rind ingredients with the reserved watermelon rind. Bring to a boil, reduce heat. Simmer for 1 hour until the water is absorbed and the rinds are tender. For the Cilantro Cream: In a blender, combine all the ingredients. Purée until smooth. Reserve. For the Carrot Croquette: Preheat oven to 400°. In a large sauté pan, heat the oil over high heat. Add the garlic and cook for 30 seconds. Add the carrots, green onions, bell pepper and jalapeño. Sauté for 5 minutes. Remove from heat. In a large bowl, combine the sautéed vegetables, cilantro, salt, pepper, cumin, curry and 3 tablespoons ground chips. Shape ½ cup mixture into croquettes. Coat with corn chips. Bake for 30 minutes. 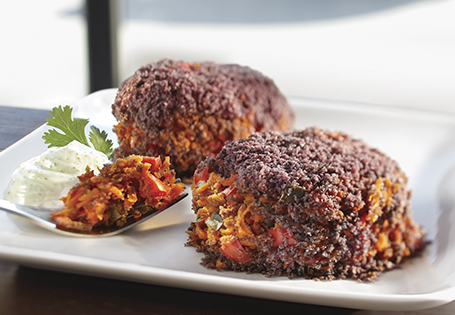 Serve carrot croquettes with candied watermelon rind or cilantro cream. TIP: Remove the outer green peel of the watermelon before you dice the rind.